Today I thought I would do something a little different and use the boxes from a Configurations print tray to create Christmas Ornaments. One Print Tray has 21 little boxes. That's a lot of ornaments! So lets get started! Each box starts out with the same paint, ink and paper. Once the boxes are prepped, you can add anything you like to the inside. Punch a hole in the top the box for hanging. Make sure it is centered left to right and top to bottom or the ornament could hang off balance. 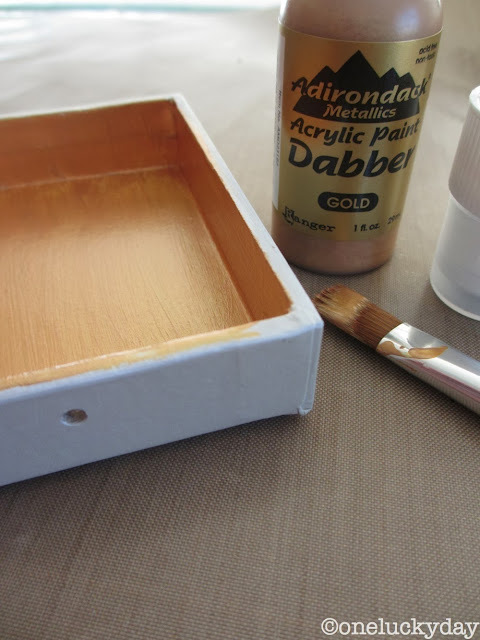 Paint the inside of the box with Gold Dapper paint. One coat is fine. 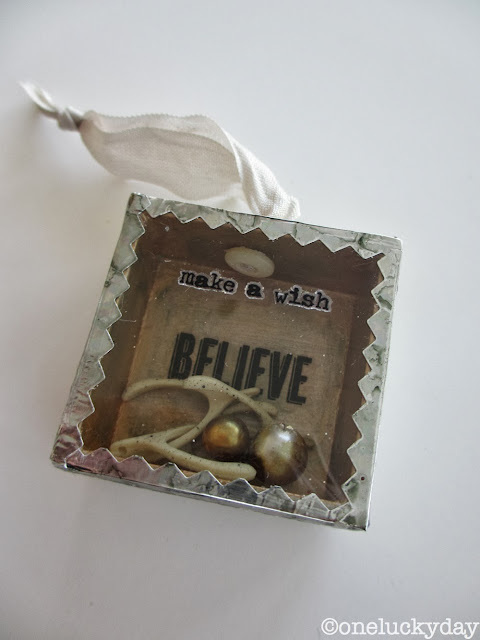 Use Multi-medium to cover the outside of the box with vintage paper. 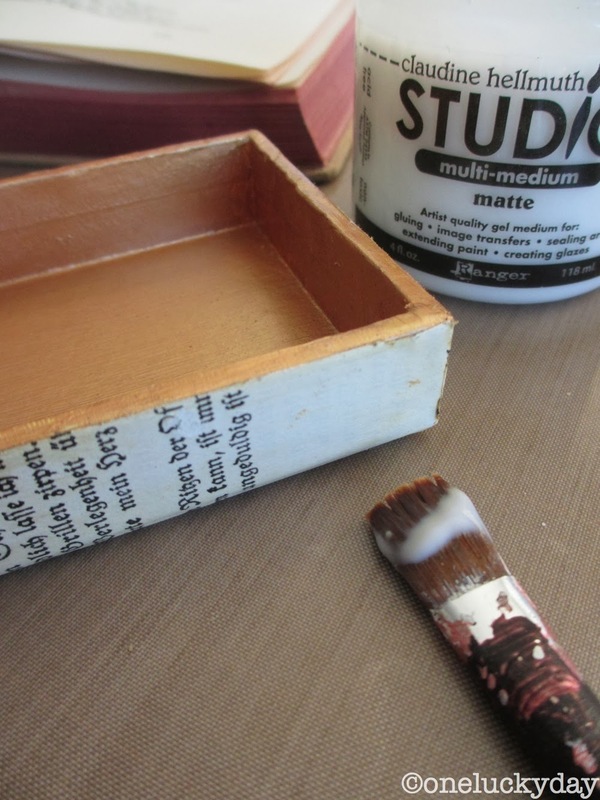 Sand away any excess, then add a coat of the Multi-medium over the paper to seal it. Use Alcohol Ink (slate) on a blending tool with felt to color the gold paint. To get the corners, I used a small piece of paper towel. Yes, it will get the tips of your fingers dirty but it's worth it. If you have acrylic nails you can always wear gloves. One note about the alcohol ink - if you get it too dark you can always add more and then wipe it away with a piece of felt. That's how I got the center lighter than the corners. I used two different methods to create a hanger for the ornaments. The first one uses a vintage button and some ribbon. 1. Thread the button onto the ribbon. Center it. 2. Thread the two ends of the ribbon into the hole from the inside. 3. Pull until the button is tight against the box. 4. Tie the top of the ribbon in a knot. The second method for hanging will be shown later in this post. All right, that is the basic boxes. Now on to the inside! 1. 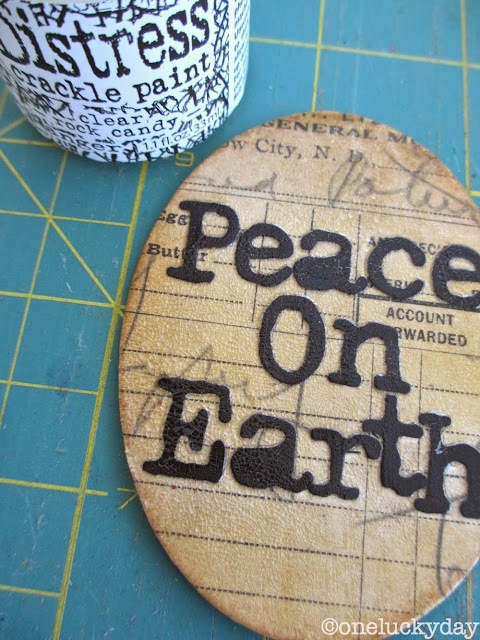 Use the Sized Ovals - medium, to cut a piece of chipboard covered with vintage paper. I used an old store receipt. 2. Cut black cardstock letters using the Typeset die. I like this decorative strip because you get both capital and lower case letters in one run through the machine. 3. Glue words onto oval. 4. Cover with Distress Crackle paint - clear rock candy and set aside to dry. 5. Once dry, ink with Brushed Corduroy Distress Ink Love the texture. 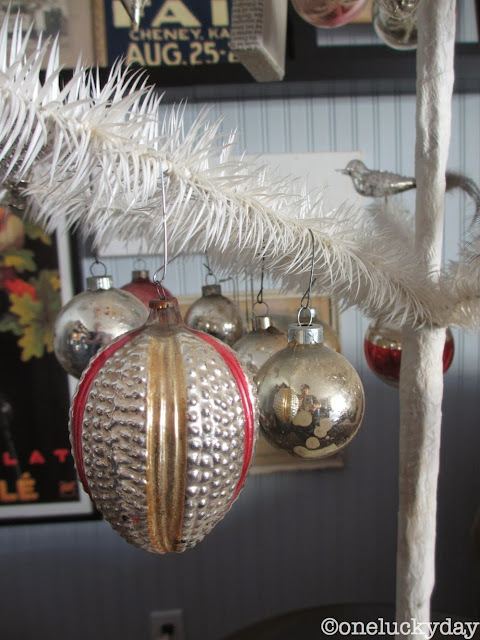 I purchased some vintage metal tinsel edging when I was in Paris (both gold and silver). This is the first time I have retrieved it from it's special hiding place to use in a project. I cannot tell you how beautiful it is, and the pictures really do not do it justice. 6. Anyway, to add the edging to the oval I cut an oval piece from a Wonder Tape sheet just a little bit bigger than the paper oval. That gave me just enough glue to add the edging around the oval. 7. I added a mirrored star that had been colored in Mushroom Alcohol Ink, a oval Vial label and a number 25 from the Christmastime Remnant Rubs sheet. Once I had all the elements, I added the paper oval to the box using foam squares so that it is raised up off the back of the box. The gold edge was too monochromatic for my taste so I painted over the gold edge with Silver Dabber paint, then used Mushroom Alcohol ink to age it. Perfect touch to go with the French metal edging. A square box this time - perfect for the woodlands wreath. 1. Start with the same basic box steps. 2. 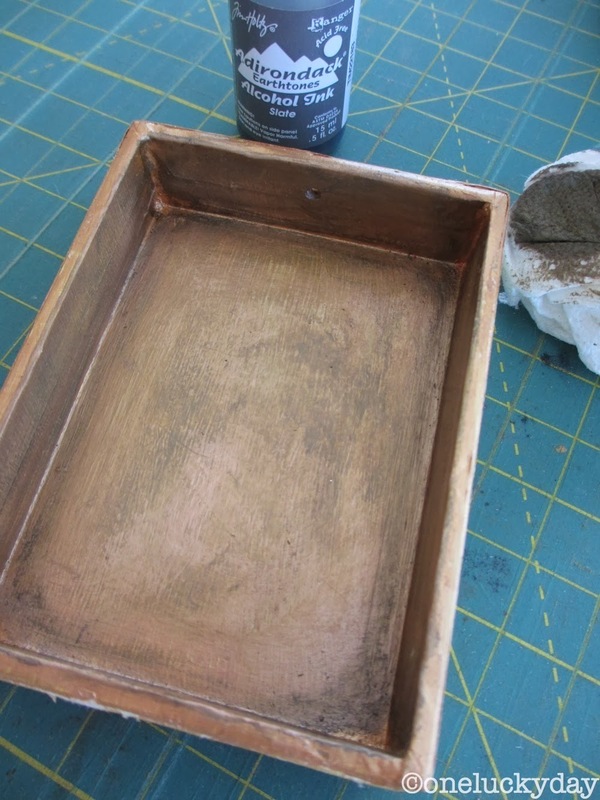 Add Glossy Accents or another liquid glue to the edge over the gold paint. 3. Pour out Stickles Dry Fine Glitter - Platinum onto a sheet of paper. Turn box over and dip into the glitter. Set aside to dry. Slide excess glitter back into jar. 4. Add Multi-medium to top of wreath. 5. Dip wreath into the jar of Distress Stickles Dry Glitter - clear rock candy to get a nice thick coat. 6. Add lace and ribbon to wreath with hot glue. Add vintage pearl. 8. Add Remnant Rub to the back of box. 9. Once wreath is dry, adhere to the box with Glossy Accents. 2. Trim the back of the small Woodlands tree so that it lies flat in the box. 3. 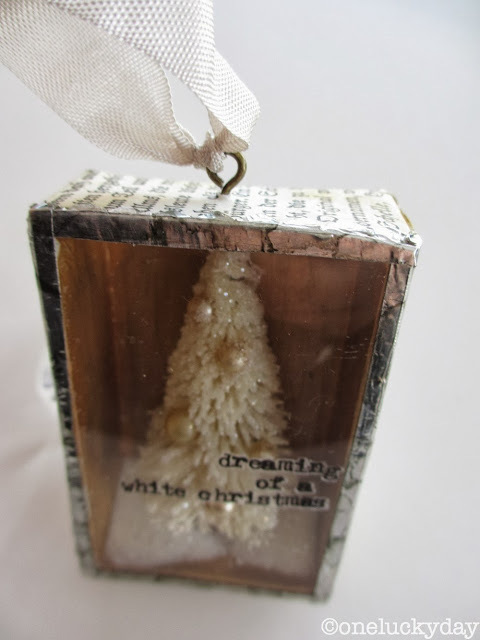 Cover the front of the tree with Multi-medium and roll in Distress Stickles Dry Glitter - clear rock candy to get a nice thick coat. 4. 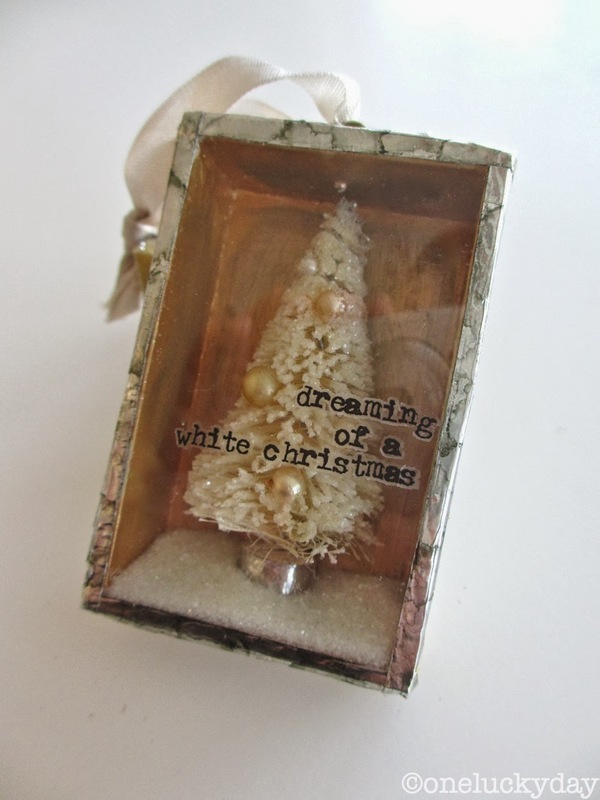 Add vintage pearls to tree - pushing them into the branches (use hot glue if necessary). 5. Cut a piece of plastic (mine is old plastic packaging) to fit over box. 6. Add Remnant Rubs to plastic. 7. Adhere tree to box with hot glue. 8. Add a bit of Distress Stickles Dry Glitter - clear rock candy to mimic snow. 9. Adhere plastic to box with Ranger Metal Foil Tape (mine has been Alcohol inked) to seal in the snow. This shows the second method of adding a hanger to the box. I mean really, how simple is that? a small idea-ology screw eye. This box is the same as the previous one except I added wishbones and alcohol inked pearls to the box. I also used a rub on the inside of the box and on the plastic cover. Here are the configurations ornaments on my feather tree. I thought I would share the boxes as well as my silver and pink ornaments that go on this tree. I have collected a few each year from places I visit. The last few I bought in Oct. when I was in Waxahachie, TX with my sister. Good times. Well, I hope you like these ideas. I love that it is a confined space to create in, and since the basic boxes are all the same it can go very fast once you have the boxes done. So many ideas, so little time! By the way, Gilded Christmas Box Kits are now in my Etsy Shop! Just click on the Aqua sidebar link. Adorable ornaments...how you get your ideas is beyond me. These are really cute and such a great idea! Happy Holidays! Gorgeous ornaments! Thanks for sharing! So stinkin' cute....oh my...just lovely, and fun, and vintage, and sparkly....just delicious!!! These are so cute Paula!! What a great idea! Love the glitter and the vintage feel and colours. thanks Anna-Karin - Happy Holidays to you! gorgeous!!!!! love all the sweet details and how they came together!!! Happy Holidays to you and yours, Paula. Two absolutely perfect vintage-making colourways were showcased by you on this post: gold and slate, silver and mushroom- genius combinations. See you in march 2014! Thank you for your kind comment. I sure am looking forward to see you again Jennifer! Always good times when you are near! I guess I know I'll be buying a bunch of Configurations boxes so I can make ornaments out of the boxes for gifts NEXT year! Next you have to come up with a tutorial on what to do with the EMPTY boxes!!! Merry Christmas to you and yours Paula. Thank you for sharing...love this idea. These are fantastic, what a super idea! Wishing you the very happiest of the Holiday season!! I am inspired. This is a wonderful project for a bunch of us to work on. Thank you for the step by steps. You have brightened my holiday for sure!! So my favorite Christmas memory was when I was about 12 years old and I opened a present that I desperatly wanted: a full on Tandy leather kit, complete with all the tools and leather to make a purse and other items! Thanks Paula for your ornament post....as always I love them! 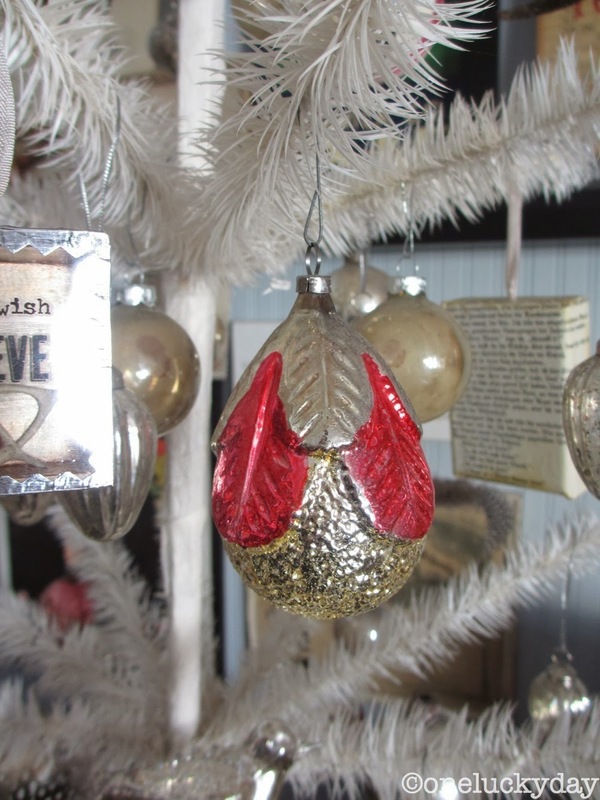 Beautiful ornaments and what a great idea! My favorite Christmas memory was the year my husband had been layed off from his job for over a year, we had two young boys, and no money for gifts of any kind. I had attempted to make a couple things so that they would have something to open and was trying to figure out how to make Christmas special for them. To our surprise a local radio station dropped off a box filled with enough food for two days and a few small gifts for the boys. To this day we have no idea who submitted our name, but it has become our most precious Christmas memory. In addition, on Christmas morning a few wrapped gifts for the boys appeared on our front porch (from neighbors). What a splendid and blessed Christmas that was and each year since we give what we can to help out families in need, in the hope that it will make their Christmas special. My Dad would pick me up after school and we would choose a Christmas tree together. Looking back, I'm sure it was hard for Mom to relinquish control, but she always claimed to LOVE what we decided upon. Such a happy memory! Gorgeous ornaments! Thank you so much for the tutorial! My happiest christmas memories are just getting everyone together in one place. WOW! Those are super cute and now i know what to do with my leftover boxes! Thanks for the ideas! The year my mother and aunt decided to sew everyone matching Christmas outfits. They were really talented sewers (and made most of our clothes for years) but all I remember is the entire family dressed in matching red vests, white shirts, and red pants (that unfortunately clashed with my red hair). We love looking back at those pictures now and enjoying a good laugh at our fashion style. Thanks for the giveaway! My favorite Christmas memory isn't particularly pleasant but one that has stayed with me 50+ years. I peeked into some bags in the upper part of the closet and saw the doll I was getting. Sure took the magic out of the holiday and something I've not repeated. Lesson learned! My favorite Christmas memory was of making Christmas cookies with my brother. He is a genius, but knew nothing at the time about 'making stuff' for Christmas. I was amazed at how beautifully he decorated the cookies, and he even carved a beautiful Cardinal, and used it to cut out cookies. What a wonderful day that was! The ornament boxes make me wish I had time RIGHT NOW to go play with my stuff. As always the vintage look and the way you put them together is amazing. My favorite Christmas memories is having free time from school and my best friends Dad pulling us all over our small town streets behind his tractor on a old sled. Lots of laughter and spills and just acting silly. Good times! oh my gosh I cannot believe how brilliant these are!!!! What a fabulous idea ... you have inspired me! Favorite memory - my sister & I got matching dolls for Christmas - and they came with an extensive wardrobe that my Grandma had crocheted for them - awesome! My favorite Christmas memory was as a child at Grandma & Grandpa's house on Christmas morning - Grandpa would record all the conversations in the room with his reel-to-reel tape recorder (we would always forget he planned this). Then after presents were opened he would play it back to us. There is to this day a recording of my Christmas at about 4 years old. Fun to hear all that is going on in the room, since many of our loved ones are now gone. My favorite Christmas memory is waking up on Christmas morning and running downstairs to see what Santa left in our stockings. Absolutely brilliant Configurations ornaments - completely delightful! My favourite Christmas memories are the recurring traditions - my brother and me sitting on my mother's bed to unpack the wonders in our stockings before all going down to breakfast; taking our large Newfoundland dog for walks in the snowy woods before coming home to the proper present opening by candlelight; playing silly word games around the open wood-burning stove until long after midnight... quiet, gentle days just for the three of us (plus Drummer the dog of course). your ornaments are outstanding....I have got to try this. Favorite memory-leaving santa cookies and reindeer carrots. My favourite Christmas memory is of one of the years we were living in the NWT. Our grandparents had come up to visit and had gone back a few days before the big day as everyone else was meeting at their place. We had our family Christmas on Christmas day and then went on a 'boondoggle' skidooing across Great Slave Lake. Needless to say, we didn't get too far before it was time to turn around and head home. Looking at a map now, I don't think we made it out of the bay! Christmas seemed like it went on for weeks that year. It was magical. Thanks for the inspiration! Beautiful as always. Merry Christmas to you and yours, Paula! beautiful ornaments! My favorite christmas memory has to be when we gave my mom a scrapbook of all the pics my mom took of us kids growing up. She freaked out! She never gets excited or emotional about anything, except this. It was awesome. She carried that massive book around with her to church and work and pretty much everywhere she went so she could show people. It was embarrassing and adorable at the same time. For years we've been giving her special gifts, and she never got excited about them (even though I thought they were great) until this one. It was awesome. These are wonderful!!! My favourite Christmas memory is waking up early each Christmas morning to find my stocking hanging at the end of my bed and opening all the tiny gifts inside before everyone awakes. There was also always a mandarin orange, mixed nuts in shells and a nutcracker tucked in too. I do this for my family each year now. These are really beautiful! Love the ones with the bottle brush pieces in them! Thanks for the inspiration! Edited to add my favorite Christmas memory. It had to be going out with my Dad every year to search, find, cut down and drag home the live Christmas tree. We always hoped for snow, the more the better. Such fond memories brings tears to my eyes just thinking about it. I wonder what my Dad would think if he knew that I continued the tradition with my husband - the only difference is the tree is now 15 feet tall. Makes me miss my Dad and smile at the same time! Oh yes, this is so beautiful. love them all!! Gonna try me some of these! My favorite christmas memory happened in 1970. It was the year we got married. We were building a house ourselves (from paycheck to paycheck) and didn't have money for a christmas tree. We knew we would be required to "landscape" before the county would give us the Certificate of Occupancy so we could turn on the electric and move in. We bought a 3 foot tall orange tree and decorated it with tinsel. After christmas, it went into the ground in the back yard. I still smile when I look out my back window and see my Christmas Orange Tree! In 5th grade, I had the best elementary school music teacher (Mrs. Schultz). We learned how to sing harmony and she taught our class many Christmas carols (some in foreign languages) and we gave a school concert. We got all dressed up and stood on bleachers and the gymnasium was packed and we sounded really, really good. Favorite christmas memory would have to be one Christmas eve when I was probably about 7 or 8 and it snowed and my parents, sister and I were walking in the snow to my grandparents house for dinner...I just remember how still and quite it was...not a common occurrence in NYC! my favourite Christmas memory is seeing my daughters face light up when she unwrapped her present and found everything she asked for.... a box to play in and to have presents to give to everyone else. What a treasure and sweety she was only three at that time. And although she's 17 years old her requests are always with others in mind. Love these boxes. I am so going to have to make these. My favorite Christmas memory is the year i really wanted an emerald ring. I was so upset when it wasn't under the tree. My parents hid it in the tree. They had me go on a tree hunt and i found the package. I was so excited! Makes me feel bad that I had a bad attitude. Love these ornaments! I can see making memory box gifts for friends throughout the year. Speaking of memories, my favorite Christmas memory is when I was a little kid - maybe 7 or so. My brother, who was 9 years older than me would come in and wake me up.around midnight to sneak out and see what presents Santa had left under the tree and eat candy left in our stockings. We did this for several years, until my brother was old enough to move out on his own. To this day, I don't remember the gifts.I received, but I remember our this time with him. My favorite Christmas Memory was getting my Santa Bear in 1987 - he was so soft and cuddly and is still with me to this day! Love the tiny boxes. Christmas spent with young cousins and making wonderful memories to last a lifetime! My favorite Christmas memory is of my sister and me waking up early on Christmas morning to see what Santa Claus had left for us. We would sneak out a few times during the night to see if he had come yet, and when we saw presents under the tree, we would run to our parents' room to wake them up. Little did we know that my mom had been up wrapping presents most of the night and had just gone to bed. I always used to wonder why she looked so tired on Christmas morning. When I was in third grade, my family traveled back to the US from our duty station in Germany via ship. In those days, almost 50 years ago, the trip took a week. We spent Christmas on the ship. I remember getting one small gift from Santa and a note saying he would leave the rest of our presents for us in our new home. And he did! What a special memory! 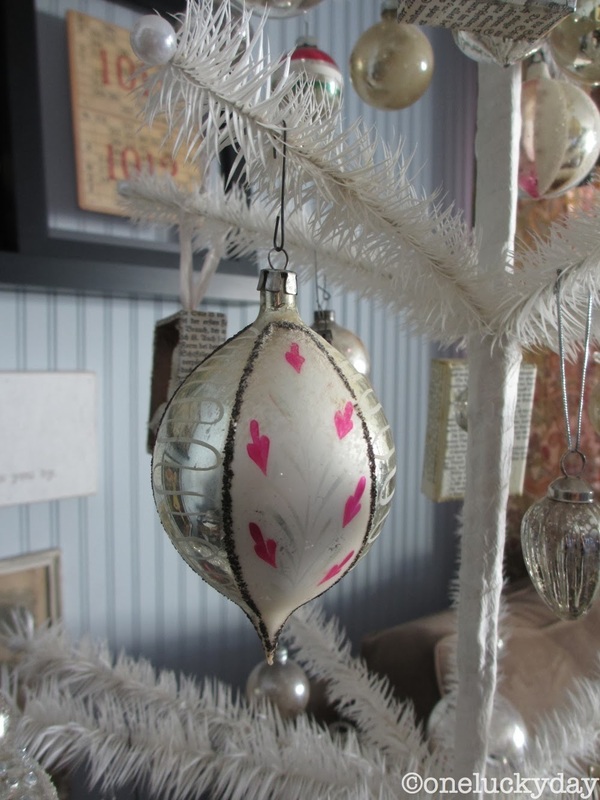 Luuuuv the ornaments!-you have a special vintage touch!! My favorite memory? Getting a baby bottle set with a little enamel pot and bottle holder to "boil" the bottles in and a little bottle cleaning brush-just like Mom's! .I was 5yrs old and that was a long time ago. I must confess I haven't thought much of the configurations until now. I just didn't see where I would want to do one. I mean you can't make all of the people happy all the time and I figured I was missing the gene that was making everyone gaga over this stuff. Well tonight, ladies, you did it once again!! You made a believer out of me and yes Virginia there is a Santa!! I want to do this now!!! Thank you and drat you all at the same time!!! I forgot to post my favorite Christmas memory. I was five and hated my naps. My mother promised me that if I laid down and read a book that something special would happen when I woke. To this day I'm still not sure how she did it but she put up a Christmas tree OVER ME so that when I woke there I was curled up under the tree all decorated and sparkling with lights and tinsel like a magic dream coming true. She even took a picture of me asleep under that tree and I have it to this day. That was 1972. One of my favorite Christmas memories is when my mom took me to the Netherlands to spend Christmas with my grandmother. On the 24th, we got a tiny little tree just as the tree stand was closing up. Then we got some shiny red and gold paper, gold spray paint, and walnuts. We cut out snowflakes and spray painted the walnuts gold and hung them on the tree. Such a simple and heartwarming time with my mom and dear granny. Thanks for the chance at a great giveaway. Your ornaments are fantastic!!!! Great idea! What great ornaments! I love the make a wish one. My favourite memory is the innocence of being a child and all that comes with the holidays. The magical feeling of the season that you tend to lose as you get older. My fav Christmas memory is being blessed with our first grandchild! Oh, what delight he will bring this Christmas as he is 20 months old and so inquisitive! The gift wrap will be his playground, I'm sure!! WHOA, Paula!! Your creative idea with these little configuration boxes is so FUN!!! Love the simplicity and sweetness each one contains. How excited I am to see what other creations you come up with in the new year! My favorite Christmas memory is my grandpa calling us on Christmas Eve pretending to be Santa! I just love these configuration ornaments, they are beautiful. My favorite Christmas memory is coming home late on Christmas Eve and finding sleigh tracks in the snow. They were from Santa Claus waiting for us to go to sleep so he could deliver the presents to our house that were always under the tree on Christmas morning. Another favorite memory is signing in the choir in church on Christmas morning when I was in grammar school. Merry Christmas and thank you for the beautiful ornaments. Paula these configuration ornaments are GORGEOUS! Thanks for sharing your know-how with the rest of us! My favorite Christmas memory is heading downstairs to see the tree lighting up the otherwise dark livingroom before everyone else is up. Thanks for the chance to win and Happy Holidays! My favorite Christmas memory happened on Christmas day, 2005. There was a snowflake take out box hanging on the tree and the fortune inside said, " Can you keep a secret? You are going to be a Grandma next year!" I was thrilled. Seven years later, Hatcher is the joy of my life. My favorite Christmas memory is watching the joy on my children's faces as they found the presents Santa left under the tree. Absolutely love how you turned the configuration boxes into ornaments . . . simply beautiful. My favorite Christmas memory/tradition involved marching around the house on Christmas morning singing Christmas carols and the parade ending in the kitchen where we had to eat something for breakfast before we could go and open presents. It was torture and fun at the same time because we marched by the tree and presents many times and got a glimpse of everything waiting for us. My favorite Christmas memory is all of the years that we spent at my Aunt Phyls as a family. Most of those relatives have passed away but I have all of the memories in my heart and mind like they happened yesterday. My Aunt Phyl had walls that spun around to reveal hidden rooms. It was an amazing house full of love and laughter. LOVE the ornaments, Paula! What wonderful uses of the print tray configurations boxes! And Oh What Fun it is to have a Christmas giveaway!! YAY! Beautiful ornaments reminiscent of the olden days!! :-) Gives me warm fuzzies! One of my favorite Christmas memories is the last Christmas we spent with my dad. He was so sick (and was dying) but he coped with the 3 hour trip to my son's house, and managed to be well enough to enjoy talking and being with the whole family. He was such a treasured gift to all of us that year. Oh, my! These ornaments are just beautiful! One of my favorite memories is of the first Christmas after my husband and I were married. After the tree was decorated we turned off the lights and and just enjoyed the tree and the lights for a spell as we sat there in the dark. I just love your projects!!!! Paula, the most wonderful Christmas memory is when we spent it away from home. The whole family went to Vegas and was upgraded to a 3 bedroom suite at the JWMarriott. Wow was it plush! They brought cookies and milk for Santa. We bought a small tabletop Tree and had all our relatives over for Christmas morning and brunch.Best Christmas ever! I love these ornaments! I also love the cute tree they are hanging on! Favorite Christmas memory....early Christmas morning, before anyone else was awake. Me, my sister and brother would have a special time where we would open each others gifts. As the youngest I always looked foward to this time. My sister and brother always spoiled me and I loved getting their presents. These are awesome little gems. So love them all. Thank you again for such brilliance. Favorite Christmas memory: Going up to our property for the holidays. One year my father and I ventured out to an area that had old summer cabins on a slope we decided to tackle for sleding. We came across an old turkey pan sitting on the outside of one the cabins. I was small enough to fit into it so that became my sled as we packed down the snow to make a trail for the turkey pan which now became my substitute sled. I have to say that afternoon was more fun than I can say. It has always held a special memory even to this day! My favorite memory is at the age of about 8, waking up xmas eve, having to use the bathroom, and sitting on the toilet, looking up at the 2 by 2 window in the bathroom, seeing Santa with his reindeer and sleigh flying through the sky. I swear, it was so real that even now, 40 some odd years later, it is so vivid in my mind, I wonder at it!! The year my dad took my brother and I to the variety store and let us fill the cart with what ever we wanted for our mom. It was so fun and considering they were divorced it meant a lot. LOVE these configuration box ornaments, whoda thunk? My fav is "I'm dreaming of a white Christmas." So cool! Lovely tree, vintage ornaments and decos, too. My favorite Christmas memory would have to be when I was in grade school and in catholic school - every Christmas eve we would have a special midnight mass where the kids would perform in the Christmas choir and were the helpers during the mass. It was a sure sign that once back home - Santa was soon to arrive and presents would be opened in the morning. Those nights were my fondest memories of the holiday season and my time in mass. 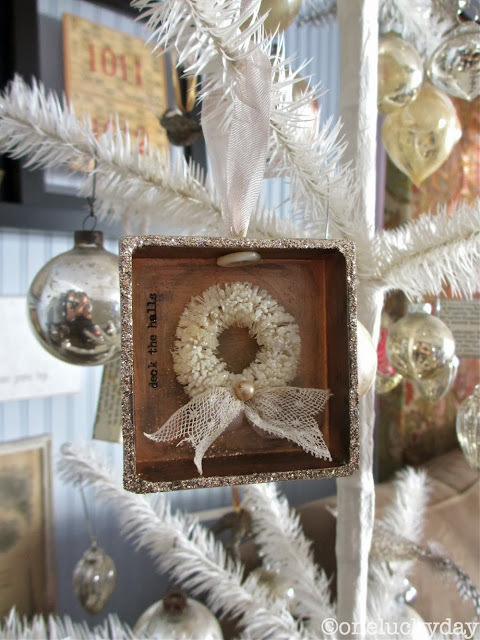 Paula, I love the ornaments you have created with these little boxes! As other have said, I will be using that idea for gifts next year! My favorite Christmas memory is when my dad decorated the tree with all blue lights! Now this was way back in the '50's, when everyone had those large multicolored lights on their trees. Not many variations on that theme at the time. My favorite color is blue. My dad decorated the tree every year and I had no idea he was going to do this. It was magical to me! And, BTW, we had that heavy silvery tinsel that he painstakingly placed piece by piece on each branch from the top to bottom of the tree. Such patience!! I lLOVE these "Configuration" boxes and when I saw your post, knew this idea was the answer to my dilemma. Scrapbooking/stamping is my #1 passion, but have begun building miniature dollhouses (1/2" scale). 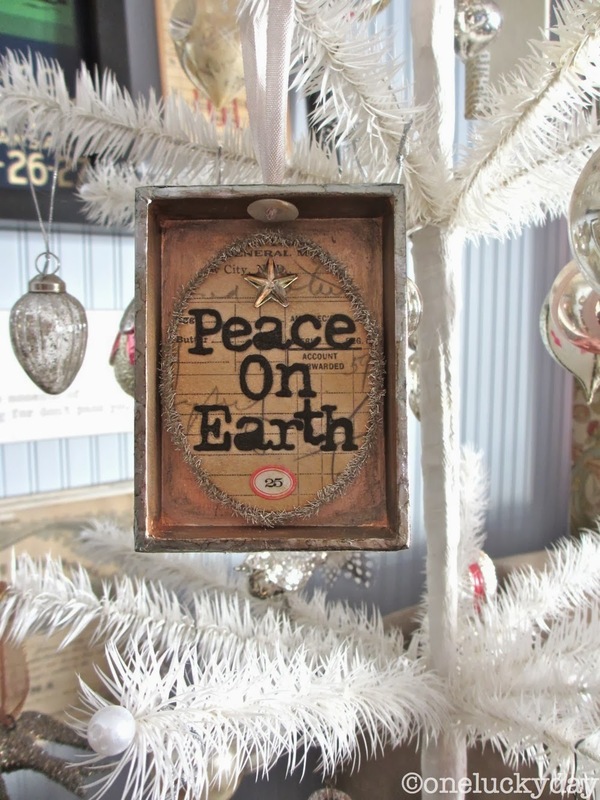 Lots of Tim Holtz products cross over beautifully for this hobby. I have to make 12 gifts for a miniaturists' gift exchange in January and these boxes will be perfect....the problem is going to be choosing which one! Thanks for all the ideas that you share to make us look like STARS!!! My favorite Christmas memory is of Santa visiting our home every Christmas Eve to deliver our presents. He would come into the living room and give us our presents and after awhile go into the kitchen with my mom and dad and close the door between the two rooms and sit with them for a bit before leaving to go on to his next stop. One year I opened the door, and to my surprise........it wasn't Santa Claus at all - it was my Uncle Joe, my dad's brother, wearing a Santa Claus costume!!!!! My favorite memory is telling everyone on Christmas Day that I heard Santa on the roof. Everyone smiled so nicely! I was three!! Love your decorations. Very inspiring! So beautiful!! I thik I'm going to try this---although they probably won't turn out like yours...lol..
my fav Christmas memory is from my childhood. 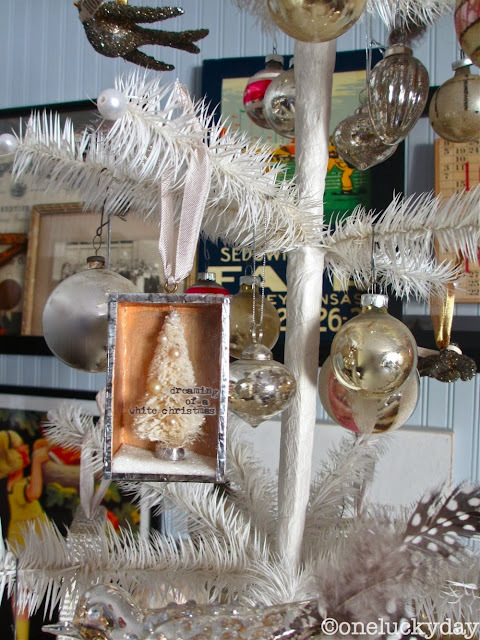 I was a child of the 60's (ok late 50's) and we had one of the wonderful silver trees. it was complete with color wheel and glass bead garland. I would sit and watch it for hours. just watching the colors changing and the shimmer of the tinsel. I remember one Christmas morning as a teenager when my Mom got ready to make breakfast and discovered we were out of eggs. We lived on a farm and got our eggs from the neighbors who were an elderly brother and sister who shared the house down the road. My brother decided we should ride the horses (which were just Shetland ponies) over to get the eggs. We never road in the winter but it was a beautiful crisp and sunny morning with everything frosted in white. So ride we did and I will never forget how good it felt to be out in the beauty of that cold Christmas morning. I can still see the steam rising from the horses nostrils. OH my!! I want to go take one of my trays apart and do these!!! Thank you for the fab idea! I love these little ornaments made from the configurations tray. i want to do them for gifts! My favorite Christmas memory ones we will make this year! I do have a very sweet childhood memory of riding home from Church with my family in a very heavy snow which was unusual for us in the South and feeling safe and in a magical place with the people I loved most. It still makes me smile. happy Holidays! My Christmas memory is going to all the family homes after we opened presents. We were young, elementary school, and after the gifts we opened we all got dressed up and house hopped! Cookie galore!!! these are awesome! One of my very favorite Christmas memories was going to the tree farm to get our Christmas tree and it had just snowed a bunch. We have the most wonderful snowball fight (there were 6 of us kids) and we got to pick our Christmas tree and watch them cut it down. when we got the tree home, it was too big to go thru the front door! My favorite memory was getting my first pair of white figure skates - just like Sonja Henie. (OK who out there knows Sonja???) Oh boy! What a wonderful idea or should I say ideas. Love the boxes and the trimmings and everything about them. Thanks for a great inspiring nudge. The Christmas my parents bought a fake silver tree! My siblings and I were so embarassed! All our friends laughed and made fun because we didn't have a live tree (this was probably 1956 or so). But the tree came with an electric color wheel where different colors were thrown on the silver. We ended up performing in front of the tree with the wheel causing our skin to turn different colors! It was so much fun and when we showed off for our friends they were impressed and wanted to play too! Favorite Christmas memory is family together enjoying the opportunity to celebrate the birth of Jesus by singing hymns around the piano. Paula, This Configuration Box Ornaments are so gorgeous. My Favorite Christmas Memory was, when both my boys got old enough to get out of bed themselves and I heard them running into our living room, and then running back to our bedroom and hollering, "Mom, Dad, get up, Santa came. Hurry. Hurry!" Just the excitement and Joy of the day, always puts a smile on my face. Going to the Candle Light Service on Christmas Eve with my In-Laws, every year, holds dear to my heart, too. Lovely use of all of my favorite Ranger products. Your creativity never ceases to amaze me! My favorite Christmas memory is decorating the tree every year. Each ornament is an old friend and happy memory. Each year I try to find a couple special ornaments for my parents' tree, too and that is a fun challenge. when my twin and i were about seven, we went into the living room and there were toys everywhere you looked. a doll for each of us on the piano stool and barbie clothes that our mom had knitted with fake fur collars on the coats. a barbie closet with more clothes inside. of course our two older sisters received presents too, but i don't remember what. I love your little ornaments ♥ I have a white tree and since my plans have changed today I might have a try at them!! My favorite Christmas Memory is baking cookies with my mother every year. It was so fun to get together in the kitchen, siblings and all, and bake Christmas cookies. I now share that memory with my own kids and we bake every year and give our cookies to neighbors and friends. My favorite Christmas memory is of my son giving me his gift he made me at school (a paper Christmas tree adorned with glitter & sequins w/his picture in the middle). The look of pride and love on his sweet little face was touching & timeless! Love this project! My favourite Christmas memory is when I was 7 and received a doll that I named ChettaMae after my two grandmothers. It's forty-six years later and I still have her and bring her out every Christmas. A Christmas memory: my Dad and a friend would take old sleigh bells and go around to certain family and friends home, jingle the bells as though Santa was going over (around really) the house, thus signaling time for bed for children inside. The year he asked me to go along and help was both sad and special. As I still wanted to believe in Santa. my favorite christmas memory is of my son reading the night before christmas to my daughter when he was 7 and she was 4. Your ornaments are so clever! Back to the contest - my favorite Christmas memory is one of participating in a progressive dinner where each stop had a themed tree and a wonderful Christmas treat to eat! YUM! Your ornaments are absolutely gorgeous!! My favorite Christmas memory was getting to play Mary in the Midnight Mass service when I was young. Thanks for a chance to win!! Having the whole family together for Christmas breakfast! Love these delightful little boxes! My husband purposed to me on Christmas Eve 1973. He had purchased my ring (he picked it out and had it sized). I had no idea this was happening, total surprise. That was 40 years ago this Christmas. We are still together and still very much in love. Thank you for asking me to share. Love the boxes- thank you- One of my childhood all time favorite memories, was when my brother and I were young and so excited for Santa Claus to come- we couldn't go to sleep- but then we heard Santa' and his reindeer on our roof and we went right to sleep. Of course -years later we learned that my daddy went out and threw rocks on the roof and then climbed on the roof to make the sound of footsteps. Well Christmas came, and my sisters got piles of gifts. I got slippers. I learned my lesson. I can't recall what I did that was THAT bad. Another memory was three of us girls snooped in Moms closet and found a lot of gifts for us. And under the bed the Santa costume. Christmas came and mom asked if we got everything we wanted. I remarked that I really would have liked some chapstick. Mom disappeared in her bedroom and the chapstick magically appeared under the tree with the crunched up wrapping paper. Us girls giggled about that and I still giggle about that. I just love Christmas and everything about it. When you're small and you go from store to store and see Santa everywhere. My parents told me that the Santas I saw were the elfs. LOVE your tree and wreath! There's something about the soft, muted colours that is magical. One of my favourite memories of Christmas is when my family would gather around the Christmas tree to play board games. Playing at a table would have been much more practical but sitting beside the beautiful sparkle of the tree made it special. We had so much fun!! My favourite memory is of an extended family get together at a beautiful beach, the house was rustic in design ( we are mid summer here at Xmas) , but what fun we had! Great food, hilarious fun playing games - no electronic devices then! And wonderful rambles and swimming! Seeing the Rockettes Living nativity. Amazing, heart lifting, spine tingling. Your ornaments are beautiful! as for a favorite Christmas memory, it is hard to pick one! My brother and I would always wake up and find our stockings left for us T the foot of the bed (to keep us busy for a while lol) I also loved the moment of going out into the living room and finding the tree all lit up with all the presents underneath it. Magical! Awesome Christmas project! I have so many tales to choose from....but I will write about when I was four or five. I really believed that I had seen Santa's sleigh in the night sky flying ever closer to our farm. I remember running excitedly to tell all my brothers and sisters about what I had seen and sworn it was the truth to my parents. It wasn't until a few years later that I realized that my believing in Santa was pretty darn strong! One of my favorite memories is of celebrating Christmas at my grandparents house with all our cousins. Granny would always get us pajamas for Christmas . When it was time to go home we would beg to spend the night , arguing that we had our pj 's. My favorite Christmas memory is the one I put a block of cheddar cheese wrapped in beautiful paper in each of my four children's stockings. They talk about that still and say its one of their favorite Christmases as well because of that unexpected gift. I did that because I would buy cheese to make homemade mac and cheese but they would eat it while I was at work before I could make it. When I would ask what happened to the cheese I bought they would all answer "the mice ate it I guess." After the first time putting it in their stockings, it was a yearly request on their Santa list. My favorite Christmas memory is from my childhood in the sixties. My brothers and I would be settled in for the night, but too excited to sleep. My father would take jingle bells up the street and ring them as our mother was telling us to listen for the bells. She would tell us that we must get some sleep as Santa was near. A precious memory as we lost dad a few years later. My favorite Christmas is the year an ice storm took out our power lines for two weeks. We made do until the electricity was restored at noontime on Christmas Eve. Terrific memories were made. (Posted originally in the wrong place, sorry!) Thanks for all of the inspiration! Lovely idea for ornaments! One of my favorite memories was the Christmas I was in kindergarten. I received my faithful blue Schwinn bike (served my well all through school). Of course the fact that we lived at the top of a hill and it was very icy made it more memorable as I careened down the hill...ouch. I have two favorite Christmas memories, the first one is when I was a little girl and I got a kitten for Christmas and all of my family was there together. My best Christmas is the first Christmas after I got married and we decorated our house, and I mean every room was decorated and outside front and back yard! We had a blast! My favorite Christmas memory...going over to Grandma & Grandpa's house for our family Christmas dinner. Grandpa always had his toy trains set up and would show old 8mm movies of when my mom and aunt were little girls. And I would spend a lot of time staring at all the cool vintage glass ornaments on their aluminum bright shiny Christmas tree! Love those memories! To find out a neighbor's gate opened and the horse got out - so for one Christmas morning , I had my very own horse !! Merry Christmas to Everyone and thank you for the chance to win such a great prize package !! My favorite Christmas memory took place 55 years ago, when I was 5 years old. I had asked Santa for a Madame Alexander bride doll that I desperately wanted. She was to decorate my room and not to be played with. On Christmas morning, I found her under our tree. I was beyond ecstatic! There was also a sweet, yellow yarn-haired rag doll who was dressed in baby blue gingham. I fell in instant love with her and began to play with her. Then it hit me...Santa had made a mistake! He had accidentally left some other little girl's doll at my house! No one could convince me otherwise. So my precious Daddy went with me throughout our neighborhood, going from house to house asking about her. Of course, no one claimed the doll. I was still upset, thinking Santa had made a huge mistake. In the end, my Daddy finally convinced me that I should take care of her and love her as if she was meant to be mine. And, boy, did I ever do that! She became my favorite doll. I still had her until the box she was in disappeared in a move when I was in my late 30s. I will never forget her or how my Daddy was so sweet about her on that Christmas Day so long ago! My favorite memory was when I was about six. I woke up on to a winter wonderland Christmas day and Santa had brought me a bike. We were very poor and I didn't in my wildest dreams think a bike was something I would ever have. love all the ornaments. my favorite christmas memory was from a few years ago when i went home to indiana for christmas for the first time in a long time. christmas day was on a sunday plus it snowed and it was the first white christmas they had in over 20 years. after church my sister and brothers all went to visit my sister in the hospital. it was the first time we had all been together for a long time, and it was my sister's last christmas with us. All of the ornaments are so beautifully nostalgic! I remember the Christmas when I was in 1st grade when my brother, sister and I discovered the hidden Christmas gifts and found out that I was getting a Barbie playhouse! That is so clever & creative. Love it. My best memory is growing up we would decorate the tree listening to Christmas records from Disney, Dolly Parton & Kenny Rogers, Bing Crosby. It was a mix. Then we would open our presents in the morning while drinking hot chocolate with marshmallows. Still love those traditions. My favorite Christmas memory was when I met my little sister for the first time. I was living in a different country and finally got to meet her when she was two years old and I was eight. She had her hair curled up in two pony tails and a pink puffy lacy dress. We are very close to this day. As my parents got older and hit 90 I decided that each year would be the most 'memorable' one! 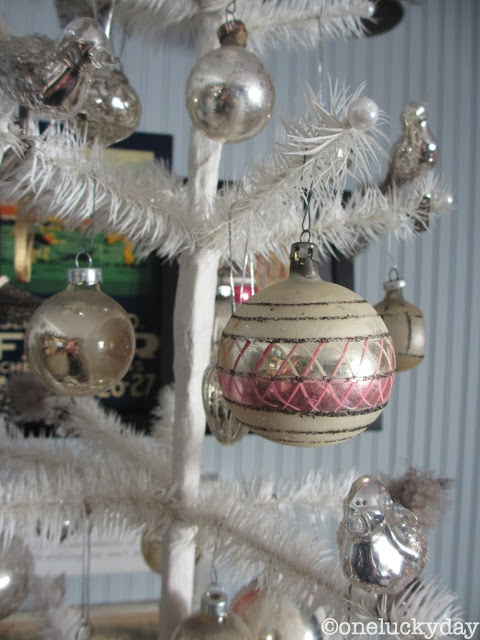 Love these ornaments and will plan to make for next year! I am kicking myself for not taking your class when you were at The Crafty Scrapper but will be sure to when you come again (please come again!). 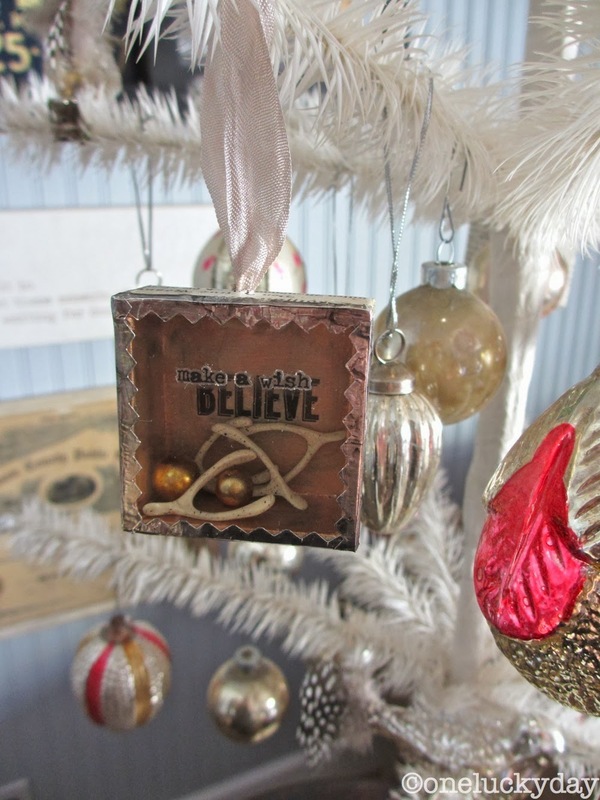 Fave Christmas memory-My Daddy always hid Mom's gift in the branches of the tree-cash, earrings, other jewelry. Even though we knew that's what he would do, my Mom would act shocked that her gift was there-lol. Sadly, my sweet Daddy passed away the day after Thanksgiving this year so he won't be with us when we gather on Christmas Eve. But I am thankful for the 88 years he was here and for the legacy of love he shared with mom in their 67 years together. I love the configuration boxes! They are so vintage and so beautiful. My favorite Christmas memory is spending my first Christmas with my husband. Love the boxed ornaments too. Reminds me of childhood decorations around the house. What I remember fondly is going to look at Christmas lights on Christmas Eve and every single time, Santa Claus came while we were gone! Every time!!! Love your ornaments, paula! My favorite Christmas memory is when my Dad gave my Mom a new diamond ring. He was in the Marines when they were married and couldn't afford a very gig engagement ring. 16 years and 8 children later, he bought her a new one. It was wonderful. The look on my kids faces on Christmas morning! Well worth the anticipation each year! Favorite holiday memory...so many... when I was little shopping with my dad on the old downtown main street.. and When Alex was a baby he took his first feeding by mouth rather than tube on Christmas eve! That was a miracle for our little premie! These ornaments are magical themselves! Thanks for the inspiration. My favorite memories were any time our entire family was together which were not that often due to living so far apart. And as a kid my favorite part would be after the gifts were opened settling down with the new book I would always receive from Santa. Merry Christmas everyone! When my sister and I were little, we didn't have a chimney and were so worried Santa would have no way to find us. So after my parents went to sleep, we snuck out of bed and opened the front door so that he had a way to get in the house. Fortunately we lived in a small town and it was long ago when people used to leave their doors unlocked. Then we ran back to bed and slept in our bathrobes and slippers so we would be ready to go in the morning. I like several Christmas songs but I would have to say Silent Night! My favorite Christmas song is Neil Diamond's "The Christmas Song". Paula, the tag is beautiful! I was so busy the day you posted this, so I took a quick look and promised to come back ... wow! These are fabulous little darlings and have inspired me to use pinecones, snowflakes, birds, etc., not to mention how cute they would be for other seasons (I'm dreaming of Valentine's Day). Thanks for your continual inspiration!